This page contains links to download and installation instructions for VPN software for Windows Vista, Windows 7, Windows 8, Windows 10. 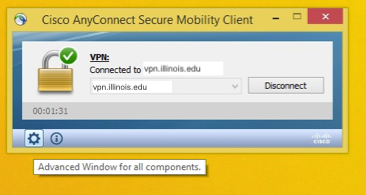 University of Illinois students, faculty, and staff can use these directions to set up their Windows computers or devices to connect to the Virtual Private Network (VPN). If you have a guest account, Technology Services recommends VPN, Virtual Private Networking (VPN) for Mobile for on-campus use. Contact your host for help downloading and installing the VPN if you need guest access for off-campus use. Download the Windows VPN installation package from WebStore. Install the software with administrator privileges. Detailed instructions are provided below. Go to the location where you saved the VPN installation package. Double-click on the .msi file to open the installer. 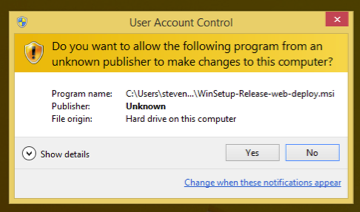 You may receive the User Account Control prompt asking if you want to allow the following program to make changes to this computer. If so, click Yes. The Setup Wizard will launch. Click Next. 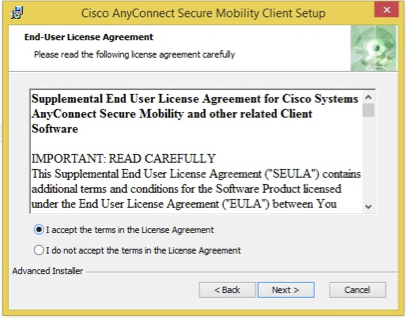 Accept the End User License Agreement (EULA) when prompted. Several windows will show the progress of the installation. When all of the installation procedures are complete, you'll be prompted to reboot your computer. After rebooting, your installation is complete. On Windows 7 and Vista: Your Programs menu will contain a new Cisco folder. Inside that folder is another folder called Cisco AnyConnect Mobility Client, and inside that folder is a Cisco AnyConnect Mobility icon. The 'hidden icons' menu in the taskbar will also contain a new Cisco icon. On Windows 8: To find the Cisco AnyConnect software in Windows 8, use the search tool in the Apps feature to search for 'Cisco'. 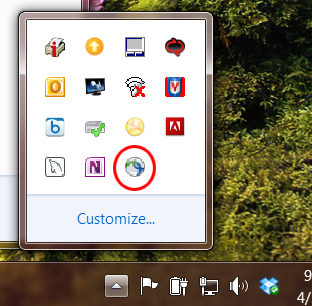 The 'hidden icons' menu in the taskbar will also contain a new Cisco icon. First, you'll identify the VPN server and start to connect. In the Ready to Connect box, enter vpn.cites.illinois.edu. Next, you'll need to enter three pieces of information. (Note: This is the most common choice. See About VPN Profiles for information about the alternatives). Note: If you want to access Library resources without logging in to the Library Gateway, you should change to the Tunnel All profile. When the VPN connects, a blue window will appear toward the lower right side of your screen. When you're done using the VPN connection, disconnect it. Click on the Hidden Icon menu (shown as an upward pointing arrow near your system clock). 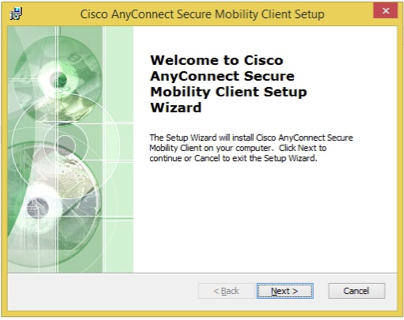 Click the Cisco AnyConnect icon. In the window that appears, click the Disconnect button. If you encounter problems using the VPN, contact the Technology Services Help Desk. 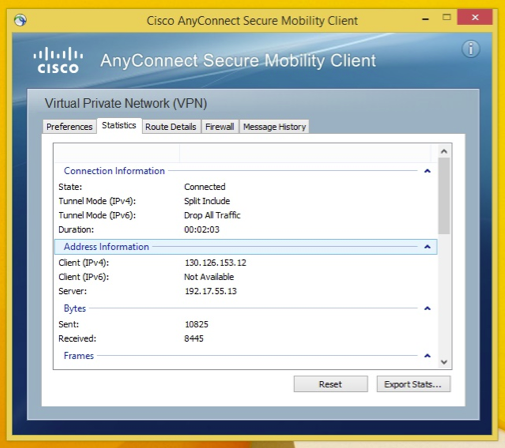 The Cisco AnyConnect VPN client gathers information that can help you with troubleshooting speed or connectivity issues. It may be helpful to open the Advanced window while troubleshooting with the Help Desk. Click the gear icon toward the lower left corner of the VPN window. Choose among the tabs as directed to help your Help Desk consultant with troubleshooting.